Intel Intelligent Power Node Manager and Intel® Data Center Manager (Intel® DCM) are platform-software-based features that reside on the Intel® Xeon® processor 5500 series, providing power, thermal monitoring, and policy-based power management for individual servers, racks of servers, and/or data centers. 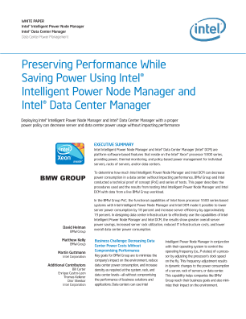 To determine how much Intel Intelligent Power Node Manager and Intel DCM can decrease power... consumption in a data center without impacting performance, BMW Group and Intel conducted a technical proof of concept (PoC) and series of tests. This paper describes the procedures used and the results from testing Intel Intelligent Power Node Manager and Intel DCM with data from a live BMW Group workload. In the BMW Group PoC, the functional capabilities of Intel Xeon processor 5500 series-based systems with Intel Intelligent Power Node Manager and Intel DCM made it possible to lower server power consumption by 18 percent and increase server efficiency by approximately 19 percent. In designing data center infrastructure to effectively use the capabilities of Intel Intelligent Power Node Manager and Intel DCM, the results show greater overall server power savings, increased server rack utilization, reduced IT infrastructure costs, and lower overall data center power consumption.